Today we highlight two MRC initiatives. First, it is working towards taking all fifth grade students on a day-long field trip of six sacred Dakota sites in the Twin Cities area. Second, the MRC is replicating a Healing Minnesota Stories art project where students learn about the stereotyped art in the Minnesota State Capitol and how it depicts Native Americans. Then, students create their own alternative Capitol art, reflecting stories from their communities and their hopes for Minnesota’s future. The state standards for fifth grade Social Studies include a requirement to teach students about indigenous nations before European contact. Sherry Kempf, outreach coordinator for the MRC, said the social studies textbooks do that through teaching about the Aztecs and the Mayans. “It overlooks the fact that we had an indigenous nation … right here before European contact,” Kempf said. The field trip includes stops at Coldwater Springs, Oheyawahi (Pilot Know Hill), a traditional Dakota burial site, Indian Mounds Park, Wakan Tipi (Carver’s Cave), Fort Snelling, and Fort Snelling State Park (the site of the 1862-63 concentration camp where Dakota women and children were held after the Dakota-U.S. War of 1862). For the first couple of years, Kempf advertised the field trip in a newsletter and teachers would sign up on a volunteer basis. The district had about eight field trips in two years. Then the project started getting more formal. Kempf worked with Rebecca Biel, the district’s Social Studies coordinator. They created a plan to take fifth grade teachers on the day-long field trip so they in turn could lead a field trip for their students. Ramona Stately and Ethan Neerdaels (both Dakota) lead the field trips to teach the teachers. The district’s Office of Indian Education helped develop classroom curriculum to support the project. St. Paul has 40 elementary schools. The goal was to work with eight schools a year over five years. They are now on year four. The goal is to have every fifth grade student participate in this day-long trip about Dakota sacred sites. There are now specific lesson plans for teachers to use in advance of the field trips. 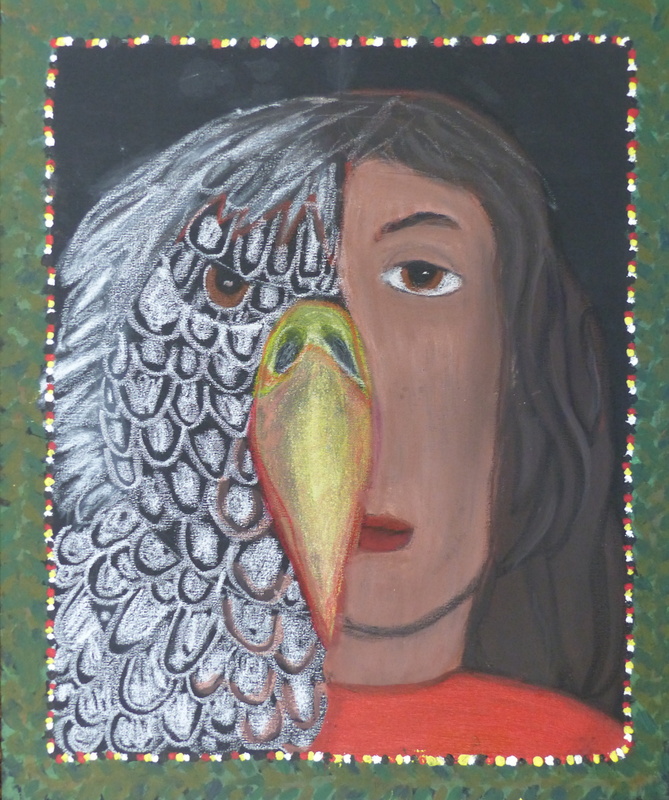 Eagle Woman (2015) by Ariana, Oshki Ogimaag Community School in Grand Portage as part of the Capitol Art Project. We have written at length about the art in the Minnesota State Capitol and its stereotyped and offensive representations of Native peoples. We also have written about our art project that teaches students about Capitol art and challenges them to create their own alternative Capitol art. Art teacher Rachel Latuff took the lead in creating this program and it has now been replicated in more than a half dozen schools. Now, St. Paul school’s MRC is replicating the project districtwide. It is the most ambitious project yet, and we are very grateful for the partnership. Some background on the MRC: Going back to the 1960s, the district had an African American Resource Center, an Asian Resource Center, a Latino Resource Center, all located in different areas. The MRC was created in 1995 to bring these different programs under one roof, Kempf said. The Center has a beautiful space in the Washington Technology Magnet School. Until recently, it has decorated the walls with artifacts it had in its collection, some of which were acquired back in the 1960s. The MRC is now shifting its emphasis to teach more about contemporary cultures. The Healing Minnesota Stories student art project was a good way to pivot to focus on contemporary culture. The MRC has hung Healing Minnesota Stories traveling art exhibit in its space. “So what this has allowed us to do is really put the artifacts away and fill our space with current cultural representations through the artwork,” Kempf said. So far, three teachers (covering 12 classes) have indicated interest in participating and more are expected. 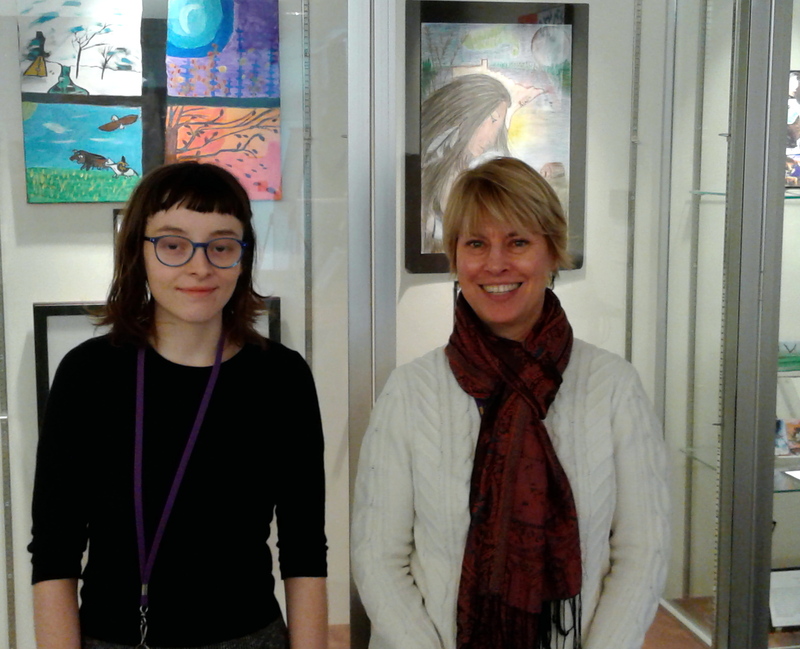 As St. Paul students start developing their own art, it will rotate into the MRC’s display. Another exciting opportunity is to create a space in the Capitol for a rotating student art exhibit. The state Capitol is going through a major renovation, and it is creating space for new art. Kempf said she envisions using the St. Paul student art to push forward the idea of student art in the Capitol. St. Paul Public Schools is opening the project to other districts that want to participate. Interested? Email Kempf and Alyse Burnside, the MRC’s program assistant, at mrc@spps.org. As for the district’s historic artifacts, Burnside said they have been talking about reviewing them with community leaders to see if they are authentic or “Hollywood.” One idea would be to create a display that critiques the items in the district’s current collection. For more, see our Capitol Art page. Like the post? Please consider following this blog or sharing this post on Facebook. Thanks for sharing this! There are some excellent programs sponsored by Mn Humanities Center that folks should check out as well. These are designed to support teachers in expanding their curriculum choices to include absent narratives in their classrooms.